Last week, American Express announced new benefits for the personal American Express Platinum Card along with a $100 increase in the annual fee to $550. Most of these enhancements would be of little value to me were I a personal Platinum card holder (though I would love to have the new metal version of the card!). At the time, nothing was said about similar updates to the business version of the card, the American Express Business Platinum Card, which I received in December. That changed on Monday. Unlike the personal card, there are no Uber credits - fine by me since I am not an Uber user - nor is there any mention of a metal card. The new benefits take effect on March 30 and the annual fee will not increase from the current $450 per year. Getting two complimentary guests at Priority Pass lounges is exciting to me. I currently have a Priority Pass membership via my Citi Prestige Card, but it only includes a single free guest. Now, if I travel with my wife and one of my stepchildren, I can take them both, at no charge, to a Priority Pass lounge. However, while 5x points on hotels is attractive on paper, this benefit carries to little value to me. I almost always book flights via an airline website, though I would be willing to consider using the Amex Travel site, since I would receive the same number of frequent flyer miles regardless of whichever portal I use to make my reservation. However, unlike airlines, if you book hotels through a third party site, you lose numerous if not all perks, including those associated with elite status. For example, free wifi and bonus point promotions typically require booking through the hotel website or mobile app. 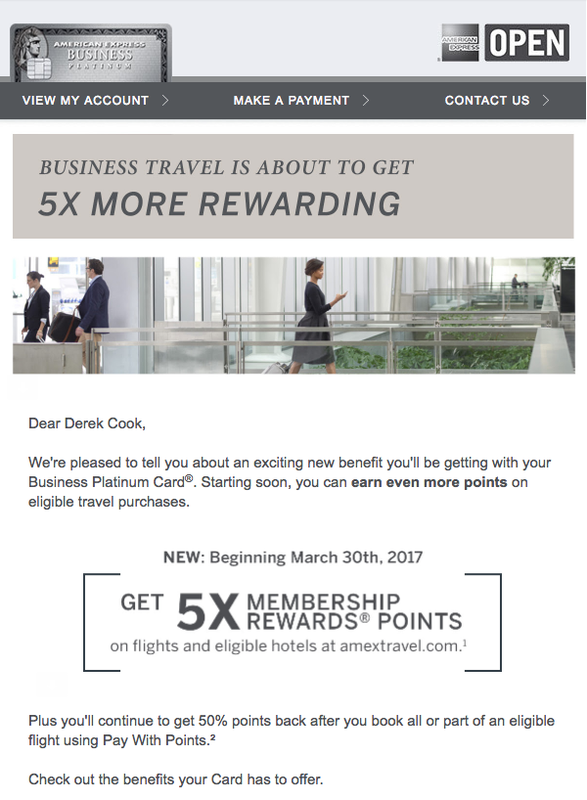 Despite 5x American Express Membership Rewards points, foregoing hotel benefits is a significant opportunity cost. Point values from The Points Guy. As the chart shows, booking through AmexTravel.com would cost me over $20 in reward value per night. When you add in the fact that the 5x bonus is available when booking prepaid hotel stays (I almost always avoid nonrefundable stays since I usually optimize and change my travel plans), that makes this benefit one that I would rarely, if ever, use. American Express is working to make its Platinum cards more competitive. The enhancements to the business version are a step in the right direction but only of limited value to me personally. If the annual fee were going up as it is on the personal card, I would be very unhappy, but I won't complain about benefits, useful or not, that come at no cost to the card member.